Given the emergent need for usability, during last year’s traditional development processes have been extended for enabling the fulfillment of usability requirements. Usability Evaluation Methods (UEMs) have been therefore proposed at any stage of the development process, to verify the usability of incremental design artifacts, as well as of the final product. 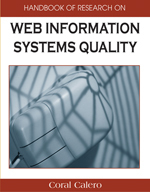 This chapter surveys the most emergent UEMs, to be adopted during the whole lifecycle of Web information systems for promoting usability. For each evaluation method, the main features, as well as the emerging advantages and drawbacks are illustrated. Some future trends, related to the need of evaluating the usability of UEMs are also discussed. Inspection Methods: a set of evaluation techniques that are an evolution from prior function and code inspection methods used in software engineering for debugging and improving code. Evaluators examine usability related aspects of an application, trying to detect violations of established usability principles (Nielsen & Mack, 1994), and then provide feedback to designers about possible design improvements. Usability Evaluation Methods: techniques that can be applied at any stage of the development process to verify the usability of incremental design artifacts and of the final product. Usability: the extent to which a product can be used by specified users to achieve specified goals with effectiveness, efficiency and satisfaction in a specified context of use. Formative Evaluation: evaluation taking place during design. Iterative Design: a design process that cycles through several designs, incrementally improving upon the final product with each pass. Summative Evaluation: evaluation taking place after the product has been developed, or even when any prototype version is ready. Web Usage Analysis: an analysis performed on the record of user accesses to the application pages, collected in a Web server log. After Web applications are deployed, Web usage analysis can be employed to analyze how users exploit and browse the information provided by the Web site. For instance, it can help discovering those navigation patterns which correspond to high Web usage, or those which correspond to early leaving.